Something old, something new - Blaster Master Zero 2. Blaster Master Zero 2 is a brand new sequel to Inti Creates’ 2017 reboot/remake of NES game, Blaster Master. 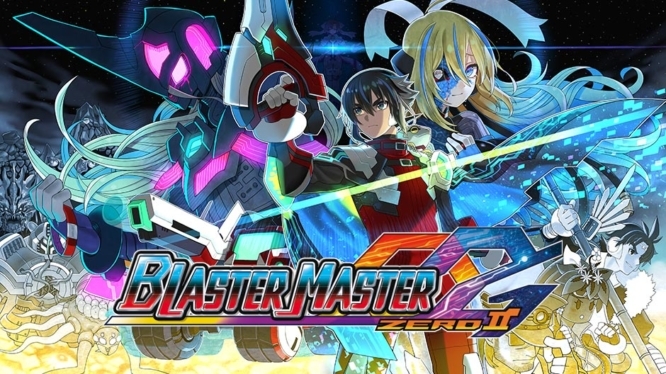 Where Blaster Master Zero followed the 1988 game faithfully, Zero 2 explores new ideas, introduces new characters, iterates on gameplay elements and expands the scale of the world to multiple new planets. Blaster Master Zero 2 picks up where the previous game left off. After defeating the Mutant Lord on Earth, MA Pilot Jason, mysterious co-pilot Eve and frog-like alien Fred leave earth to find a cure for Eve’s mutant infection. They jet off into space in a new, upgraded MA Battle Tank dubbed “Gaia-Sophia” in an attempt to find Eve’s home world. 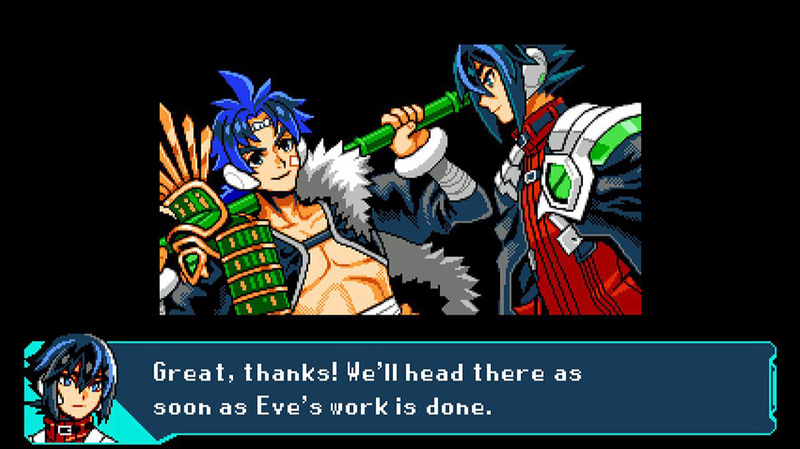 Blaster Master Zero 2 isn’t heavy on story, but important moments and conversations are illustrated beautifully through static artwork and written dialogue. The game iterates and innovates on original’s NES style, but still manages to feel authentic in its presentation. Most of the main planets you visit have their own self-contained mini-plots and unique characters to meet. However, these stories aren’t really linked to one another and only serve to expand the game’s world, not push the plot in new directions. While the original game was a lonely affair for the crew of Sophia-III, the sequel introduces some new characters that give the game’s world more life. You encounter the crews of other MA Battle Tanks who are also fighting the mutant scourge that’s taking over the galaxy. Not all characters are this friendly. Each of these uniquely designed characters has their own personality, and dynamic with the protagonists. They serve to offer the player quests, assistance, deeper information about the worlds they are found on, and reward them with key story items. These characters offer a different approach to the way the game usually tells you what to do and where to go, which was a very welcome addition. Alongside the comic relief and vicious rivalries, they also add depth to the game’s world, something that was not present in the first title. The 8-bit inspired visuals are not a far cry from the previous game’s retro aesthetic, though there are some improvements. The characters, worlds and enemies are all noticeably better looking, with more detail and general polish. The soundtrack, as you would expect, is also filled with catchy chiptune melodies, with each encounter and world offering its own unique song. 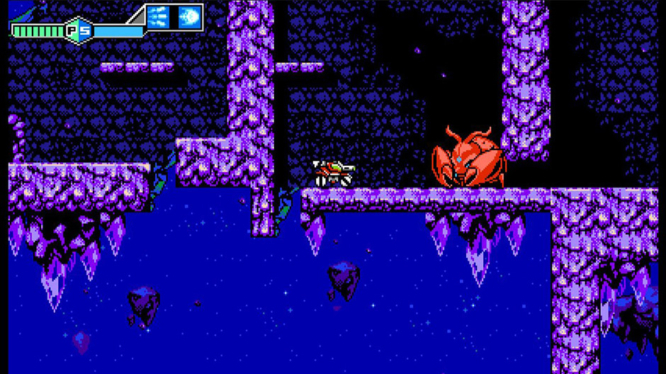 Frustratingly, Blaster Master Zero 2 doesn’t make use of the Switch’s full screen width and instead places small bar bars at either side. While these bars were also present in the previous game, it was understandable as the title also released on Nintendo 3DS. Although the bars didn’t detract from the overall experience, it’s still confusing why the Switch-exclusive sequel has opted to continue this trend. 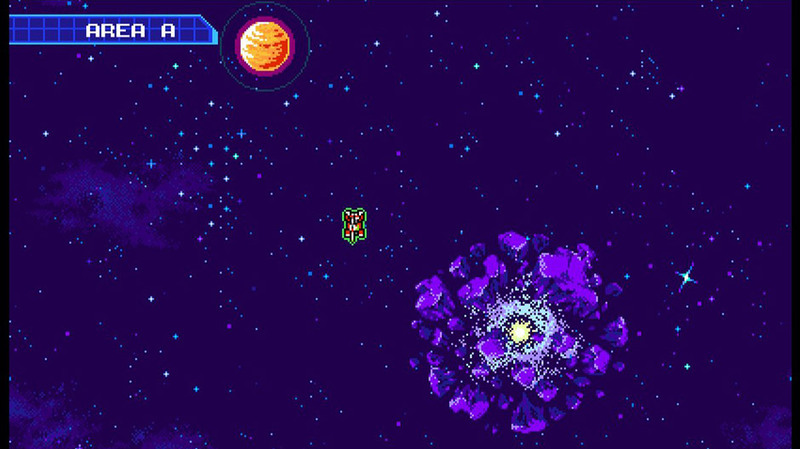 At its core, Blaster Master Zero 2 plays nearly identically to previous games in the series. The game is split into two distinct modes: side-scrolling platforming (on each of the planet’s overworld in Gaia-Sophia) and exploring dungeons as Jason in a top-down adventure perspective. You spend half of your time in the game exploring the terrain of each world in Gaia-Sophia. In this side-scrolling mode, you can jump, fire the cannon at enemies / breakable terrain and use one of the many sub-weapons that you collect on your adventure. The sub-weapons are varied in both effect and application. A trio of straight flying missiles might help you deal large amounts of damage to armoured enemies from afar, but a dash attack charges you though enemies and can also used to overcome path-blocking elements. Learning what each sub-weapon can do and where it can come in handy is part of the fun, encouraging you to try out different options. Sub-weapons are powered by SP, which just like in the first game, can be replenished by collecting pickups dropped by enemies. A new addition to Zero 2, however, is the ability to replenish SP by falling from great heights or by taking damage from enemies and environmental hazards. Whilst this is the riskier method, it means you can re-fill your SP in a pinch when facing down a tough boss. This may be a necessary trade, as running out of SP renders Gaia-Sophia weak and helpless for a short period of time. The risk-reward nature of SP management makes fights more dynamic – and less reliant on pickups and patience. You’re more vulnerable outside of your battle tank! In the overworld, Jason can hop out of Gaia-Sophie at the press of a button. Outside the Gaia-Sophie, Jason can shoot and jump but is vulnerable to both enemy attacks and fall damage. This makes levels where you’re required to leave the safety of your battle tank to slip through small gaps or climb ladders pretty treacherous. Dotted around each world are small doors that only Jason can fit through, transporting him to the game’s top-down dungeons. In dungeons, Jason is much more armed and ready to fight, with his modifiable gun and own range of sub-weapons. In this view, there’s no fall damage to contend with and enemies are much more to scale. Jason’s blaster gun starts as a simple peashooter, but by collecting gun capsules it can be upgraded up to 7 times. You can choose which of the 8 levels you want to use – from a beam that fires through walls to a destructive wide beam that decimates enemies in front of you. Every time Jason takes damage, the max level of the gun is reduced by one. There will be many times where you come up against a particularly tough enemy or boss and are reduced down to just your basic gun. These moments present a bigger challenge to overcome, but really you want to avoid getting hit if you don’t want to struggle. A new addition to Jason’s arsenal is a powerful counter move. Hitting the X button just as an enemy fires an attack lets you dodge and return fire, and this can be chained together with multiple enemies to clear a room more easily. Similar to how Gaia-Sophia’s SP system rewards risky play, the counter lets you make use of a bad situation and turn the battle in your favour. As there is no real penalty for missing your cue, I found myself using the counter as much as my main weapon. Whilst the system is very cool and feels very rewarding to pull off, it is a bit too easy to exploit, instead of just being a reward for good timing. Throughout the game, you’ll discover different sub-weapons and counter attacks for Jason to take advantage of. There will be weapons you prefer to others and you may discover combos that can deal massive damage in one hit. Being able to pick your favourite gun level, sub-weapon and counter, without being penalised by the game, means that you’re free to play however you want. I appreciated how different combinations worked better for different bosses, and having these kinds of options promotes experimentation and replayability. Instead of exploring one large connected world like in previous Blaster Master games, there are now multiple space maps to explore. Each area is comprised of 1 large main planet and multiple smaller planetoids. The larger planets contain the bulk of the game’s levels and are necessary to continue on your adventure. The smaller planetoids usually contain optional challenges to complete that grant the player helpful upgrades or new weapons as a reward. This new method of progression is a welcome change, as the game feel more freeform, making it easier to leave a difficult dungeon or boss and come back to it later. This expanded sense of scale is evident in many of the game’s different elements and is clearly something the developers focused on for the sequel. Main worlds provide a nice dash of variety and include a planet used for farming, a flower-covered world where nothing quite makes sense and a space station where you’re stalked by a mutant-corrupted security droid. 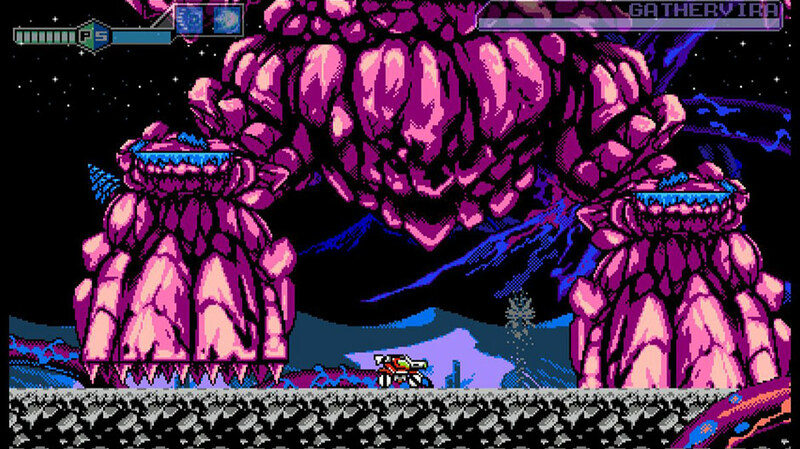 These are distinct in design, colour and style; each one has its own obstacles to overcome, and in classic Metroidvania style you will need to travel back and forth between planets to see and collect everything. The planetoids in each area are split between side-scrolling challenges or mini dungeons to explore and are vital to maxing out Jason’s abilities. There are some pretty challenging planetoids, one, in particular, took me nearly an hour of trial and error to complete. Remember, these are not necessary to complete the game, but the collectables they provide are invaluable for the later worlds. Collectables include health or SP powerups, new weapons for Gaia-Sophia or Jason, and maps to planetoids in different areas. You can keep track of your progress by visiting each planet, but I do wish the game had a dedicated collectables screen as trying to track down the last one I had somehow missed (after unlocking every area and planet) was a challenge. Enemies vary in size and strength; smaller grubs are killed in one hit from your cannon, whereas larger armoured enemies require you to take advantage of your sub-weapons to dispatch. The many bosses strewn across the worlds are where the game’s combat really shines; from hulking mutant mountains with multiple stages to beat, to classic arena-style bosses at the end of dungeons. 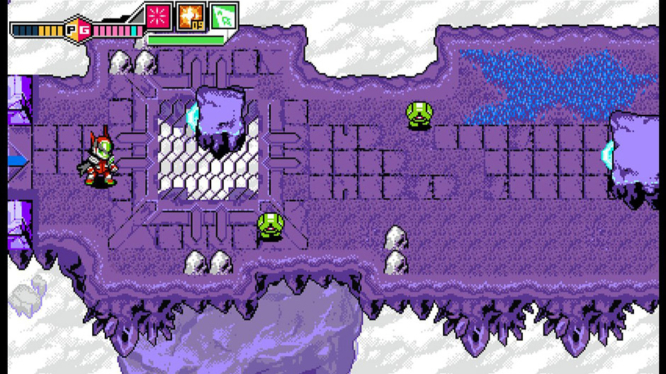 One of the game’s larger bosses – featuring platforming elements. Bosses can prove challenging, there was more than one occasion where I was part way through a battle thinking “this is easier than I thought” just before it killed me for not paying attention or planning my next move. There’s a nice mix of side-scrolling bosses requiring Gaia-Sophia’s firepower, as well as dungeon bosses that are fast-paced and dangerous. The MA pilots that you meet on your journey are also fought the first time you meet them. These smaller scale boss fights (where you are essentially fighting a mirror image of your own abilities) were a welcome change that makes you think on your feet instead of pummelling missiles into a giant, ugly creature. One minor (but welcome) change is how the HD rumble reacts to boss fights. In the previous game, beating a boss made the Switch vibrate incredibly loud, fast and hard – so loud in fact that it was audible even across the office I was playing in. However, this time, defeating a boss causes a vibration of the same ferocity as the rest of the game’s haptic feedback, so no awkward explanations will be needed. A solid mix of Platformer, Dungeon Crawler and Metroidvania that iterates on a faithful NES remake - turning it into a new game that stands on its own two feet. A digital copy of the game was purchased for this review.